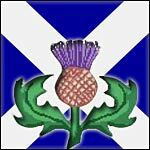 Scotland Merchandise - Replica Scottish Swords - Claymores - Dirks - Targes - Basket Hilts - Weapons and Accessories. This Brown Sporran with Braided Tassels is part of the traditional dress of the Scottish Highlanders. This leather pouch is meant to be hung within easy reach- from the front of the belt on the kilt. This rugged pebble-grain sporran has a trio of leather tassels decorating the front. Made in Spain, this Claymore Letter Opener in Bronze is enclosed in an attractive card that details the history of the sword in both English and Spanish. Made in Spain, this Claymore Letter Opener Pewter is enclosed in an attractive card that details the history of the sword in both English and Spanish. The Claymore Sword Earring and Necklace Set features green crystals set into the hilts of each sword. The actual size of each claymore is about 2 inches by 3/4 of an inch. The earrings are suspended on surgical steel fish hook ear-wires. The Claymore Sword Earrings feature your choice of Swarovski cabochon crystals set into the hilts. Each sword is about 2 inches long and comes on surgical steel fish hook ear wires. Our Functional Scottish Targe is made with wood, covered in leather, and decorated with brass studs. Our Scottish kilt belt is 3 inches wide. Useful for holding together your kilt, or to wear with your medieval garb! The belt comes with a heavy-duty stainless steel buckle. Available in a wide variety of colors. Colors and designs of the plaids used for early kilts conveyed no specific meaning until the 18th century. This kilt is available in either red and green or camel and navy plaid. Our Damascene Scottish Claymore Letter Opener by Marto is manufactured in Toledo Spain by the famous Midas factory of the Marto swordsmiths. Our Gentleman's Kilt will work for a Scotsman, Scottish man, Irish man, or highlander’s adult costume. Perfect for Halloween or themed costume parties. A truly Scottish boot with the traditional Ghillie appearance. Hand made in the U.S.
Not just for dancing, these suede leather Scottish dancing shoes, or ghillies, are great for wearing everyday. You will love the look and comfort of these shoes. Our Men's Ghillie Shoes are a truly Scottish shoe, with the traditional Ghillie appearance. Hand made in the U.S.
Our intricately designed Scottish celtic belt buckle which features a saltire flag with lion rampant design on each side. Finished in black enamel - an extremely stylish item. Our Grained Leather Kilt Belt with Antique Thistle and Celtic Knot Buckle. Our Leather belt has velcro fastening on reverse which allows generous size adjustment. The Thistle buckle is made from stainless steel and has universal kilt buckle clip, can be worn with any kilt belt. This belt is 2 1/2 Inches wide. Our intricately designed Scottish Celtic belt buckle which features a saltire flag with rampant lion design on each side. Scottish Baronial Castles 1250-1450 by Michael Brown examines the three periods of castle building in the years 1250-1450. Our Scottish thistle is cast in lead free pewter, then riveted to a strip of suede that is 12 inches long and 1 1/8 inches wide. Crafted in the U.S.
Our Scotland Lion Pewter Tankard One Pint measures 5.11 inches tall by 3.14 inches wide. Help your loved one to swell with patriotic pride by giving them this outstanding Scottish lion pewter tankard. Our Heavy Gauge Scottish One Pint Pewter Tankard measures 5.11 inches tall by 3.14 inches wide. Designed to help the recipient embrace their Scottish heritage. Our Scotland One Pint Pewter Tankard measures 5.11 inches tall by 3.14 inches wide. Celebrate all things Scotland with this outstanding one pint pewter tankard that is the perfect gift for anyone with Scottish heritage. Our Round Thistle Pewter Flask 6 Ounces measures 4.33 inches tall by 3.54 inches wide. This handsome 6 ounce pewter hip flask, is the perfect gift for a whisky lover or for a loved one who is proud of their Scottish Heritage. Known as the greatest king of the Crusades, Richard the Lionheart’s emblem is depicted in brass on this all steel shield from Marto of Spain. The edges have been accented with polished brass, along with heavy rivets. Comes with hanging chain attached. Kilts were originally pleated on the floor before being tied around the waist. This attractive kilt is a bit easier- the pleats are sewn in. Made from acrylic wool in your choice of red or brown plaid. The Scottish Claymore Letter Opener is a pewter letter opener in the shape of a Scottish Claymore supplied in a display box with clear lid and with informational sticker describing the sword and its design. 6.25in Long. These Field Kilts or Scottish Kilts are made from cotton plaid, the ultimate in comfort and style. Scottish sporran with Celtic design. Comes with removable adjustable shoulder strap. Made in Spain, this Wallace Letter Opener is enclosed in an attractive card that details the history of the sword in both English and Spanish. Bronze Finish. The Scottish kilt colors and designs of the plaids used for kilts conveyed no specific meaning until the 18th C.
Miniature version of a Scottish Claymore, renowned weapon of the highlanders. Over 9 in. long. An excellent letter opener and a great desk accessory. Miniature version of a Scottish Claymore, renowned weapon of the highlanders. Over 9" long comes with sheath. An excellent letter opener and a great desk accessory. Our Wallace Scottish Letter Opener is a fine miniature of the larger Wallace Sword produced by Art Gladius. Blades are stainless steel and detailed like their larger counterparts. Letter openers make perfect accents for the home or office. We've made this attractive kilt easier for you to put on by sewing in the pleats, a buckle is given for better fit. This Scottish Thistle Pewter Button is cast in the U.S. from lead free pewter and measures 1 inch by 3/4 of an inch. It features the Scottish thistle and your choice of colored background. Our Scottish Thistle Buttons is made in fine pewter. It measures 1 inch in diameter. Our Scottish Thistle Buttons is made from lead free pewter in the USA. This button is the perfect edition to add the finishing touch to a medieval or renaissance garment. Our St. Thistle Handle Pewter Tankard One Pint measures 5.11 inches tall by 3.14 inches wide. The very best gifts for any occasion are those which have a bit of thought put into them, to make them personal to the recipient. Our Sporran Wedge Pewter Flask 6 Ounces measures 4.72 inches tall by 3.54 inches wide. It is difficult to miss the fact that this wonderfully designed pewter hip flask is designed to celebrate everything Scottish. Our Tree of Life Pewter Flask 6 Ounces measures 4.72 inches tall by 3.54 inches wide. This wonderful six ounce pewter hip flask has to rank among the most stylish, beautiful and truly is a wonderful gift for a loved one. Our Tartan Pewter Flask 6 Ounces measures 4.72 inches tall by 3.54 inches wide. Tartan is as much a part of the history and traditions of Scotland as Edinburgh Castle, haggis and the Loch Ness monster, so why not celebrate that history. Our Top Pocket Thistle Pewter Flask 3 Ounces measures 5.90 inches tall by 1.77 inches wide. Bursting with Scottish pride, this slim 3 ounce pewter hip flask is the perfect gift for a proud Scot. Our Scottish Lion Stamped Pewter Flask 6 Ounces measures 5.11 inches tall by 3.54 inches wide. If you're looking for the perfect gift for a proud Scotsman then look no farther as you have found it with the 6 ounce pewter hip flask. Our Scottish Lion Badge Pewter Flask 6 Ounces measures 4.33 inches tall by 3.54 inches wide. This round style six ounce hip flask is perfect for a proud Scotsman thanks to the beautiful rampant Scottish lion badge that adorns the center of the flask. Our Stamped Thistle Pewter Flask 6 Ounces measures 4.72 inches tall by 3.54 inches wide. The perfect commemorative gifts for any occasion, our hip flasks are lovingly crafted from the highest quality lead free pewter. Our Thistle Wedge Pewter Flask 6 Ounces measures 4.72 inches tall by 3.54 inches wide. Bursting with Scottish pride, this traditional sporran shape six ounce pewter hip flask is the perfect gift for a proud Scot or for someone partial to a snifter of Scotch as a treat. Our Scottish Thistle Pewter Flask 6 Ounces measures 4.72 inches tall by 3.54 inches wide. The perfect commemorative gifts for any occasion, our hip flasks are lovingly crafted from the highest quality lead free pewter to ensure that they will not tarnish over time. Colors of the plaids used for early kilts, like this Scottish Kilt, conveyed no specific meaning until the 18th century. At one point in time, the higher classes showed off their means by the number of extra colors their kilts displayed. This Scottish cap is perfect for those blustery days on the Highlands or any Celtic event, comes this wonderful cap. Made of 100% olive colored wool and has a soft cotton ball attached to the top. S (7-1/4), M (7-1/2) and L (7-3/4). Our Functional Scottish Targe is made with wood, covered in black leather, and decorated with brass studs. Our Smaller Scottish Hand Targe is made with wood, and overlaid in leather; It is accented with numerous brass studs and brass shield boss. The suede-covered back of the shield is finished with a thick leather arm straps. Our Functional Culloden Scottish Targe is made with wood, and overlaid in genuine leather; It is accented with numerous brass studs. The suede-covered back of the shield is finished with a thick leather arm strap and hand grip. Copyright © timelesstailors.com 2019. All Rights Reserved.